The TE1000 Vector Impedance Analyzer has enjoyed more than 20 years as a popular choice for obtaining impedance measurements at RF frequencies by hundreds of customers around the world. It is a precision, portable impedance analyzer which enables the user to make highly accurate impedance measurements through VHF range (0.5-150MHz). The TE1000 has been discontinued however all of its functions are present in the TE3000 with the same user-friendly interface and convenient probe plus more! See the TE3000 page for details. The TE1000 has full vector measurement capability, and accurately resolves the resistive, capacitive and inductive components of a load. The user can display impedance in polar form, rectangular form, series R-L-C equivalent or parallel R-L-C equivalent circuit. On board algorithms generate a range of related parameters including VSWR, complex reflection coefficient, and return loss against a user defined characteristic impedance Zo (normally 50 Ohms). The TE1000 uses an RS232 interface and is supplied with a third part serial to USB converter for connection to a PC. It shares the same software as the new TE3000 series providing swept frequency capability and facilities for complex data analysis, data logging and graphical display. Any application capable of comm port control can send commands and receive data from the TE1000 making it perfect for automated and remote data collection. 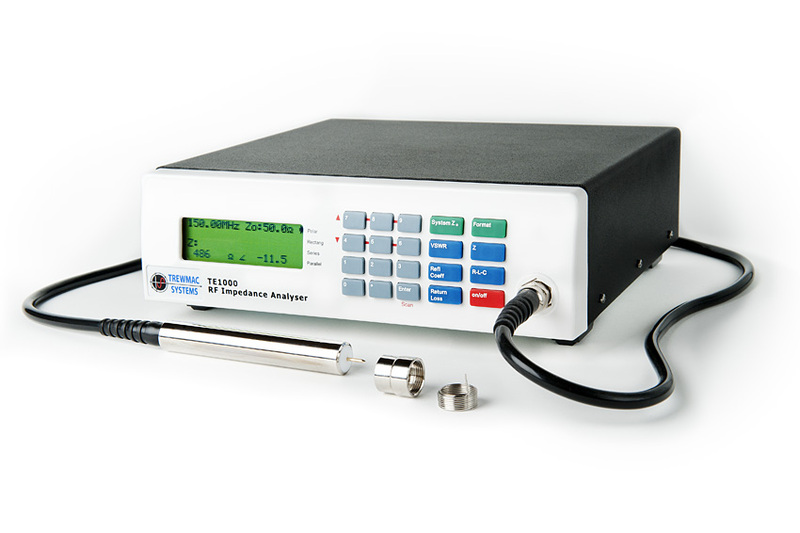 The Trewmac Systems TE-1000 Vector Impedance Analyzer is supplied in a lightweight, rugged aluminium case with all the accessories included to operate the unit to its full potential. The unit itself can be powered by the mains adapter or by the internal battery making it ideally suited for both bench top and portable use. Typical applications include RF design and development, antenna testing and tuning, impedance matching, component testing, cable fault finding, filter design and testing, and cutting cables to precise electrical lengths. Easy and accurate 'in circuit' measurements. Display formats include Impedance, Reflection Coefficient, VSWR, Return Loss, Equivalent Series or Parallel RLC. Software includes: VF, Zo, Distance to fault, Impulse response, and spectral analysis functions. Multi trace plotting, Smith charts, markers and annotations.